The champagne still sweet on my lips and the remains of Sunday’s roast lingering, I decided a soothing sip of port was a necessity. After a slower than usual shuffle to the sideboard, I spied the this picture, which reduced me to a stupefied state. 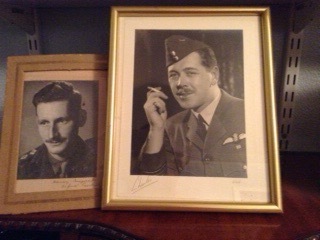 The brace of top lipped leviathans are my grandparents; Major Alick Bernard Dudley on the left and Wing-Commander Cecil Reginald Brainsby Wigfall (aka Rex, due to his regal performances on the rugby field at Haileybury) on the right. These two fine gentlemen donated their Accomplished DNA to me. Sadly one strand was missing – the ability to grow a marvelous moustache. Both chaps departed this green and pleasant land with thick proud military moustaches. They wore them with valiant dignity, knowing that, at a single glance, one could tell that the ageing rakes were once war heroes. This month I joined the throngs of male Londoners in Movember and have kept to the simple rule that one must keep a moustache for the 30 days of the month. As a youth I was blessed with the hair of a young healthy Arian marching in the mountains. The years have sadly dulled the effervescent flaxen glow, leaving me with a mousey brown mop twinned with an awkward glimmer of auburn in the wrong light. My moustache has taken a similar hue, with the light appearing to be consistently awkward above the lip. I began November drunk with nerves and thin on follicle confidence. Despite the initial hesitancy, I have on the whole embraced the fuzzy top lip – delighting in the showmanship of the situation and the fraternal moments when I walk past a fellow “mo-bro” and enjoy a lingering nod of solemnity. I decided to go for a classic old school military tache – making sure I did not mimic the egregious trio of Hitler, Franco and Stalin. Currently I am veering more towards the cadaverous fugitive Lord Lucan – who I’m reliably informed takes his annual return to London every November, brazenly skipping the streets and going unnoticed. Bars or times with pals and family are as easy as Mark Waugh’s languid back foot drive. However, there are moments when I wished that I could take the nearest sellotape to my lip and tear the bally tache off. The tube is often a house of vulnerability – I’m usually perspiring last night’s martinis and aimlessly attempting to keep my hands from shaking the morning paper too loudly. Beady commuters’ eyes track my face and beam onto my whiskers, staring at it like a tourist’s camera fixed upon the Mona Lisa. The corners of my mouth don’t offer a knowing smile – more of a bellicose frown. Other than the peculiarity of wearing a moustache in modern London, it is an achievement of a lifetimes dream. I’ve looked at chaps such as Clark Gable. Olly Reed, Merv Hughs, Bruce Forsyth, Terry Thomas, and obviously Rex and Alick stroll in unwavering masculinity underneath fabulous fur. I’ve harboured a desire to have a tilt at that but never had the moral fibre to follow it through. Beards are all fine and dandy but a moustache is defiantly the real statement piece! The men of the seventies with their old club ties and suits knew how to indulge pomposity. Look at an episode of Fawlty Towers. It is littered with hairy lips pulling on cold gins. Alas the conformity of that era has gone, replaced by people who believe a beard to be normal and a solid tache eccentric. If eccentric it made me this month, then I’m happier than Basil Fawlty slapping Manuel endlessly on the bonce. It has ultimately been a roller-coaster of a month. The initial novelty was quickly replaced by the constant embarrassment of harbouring a rodent refugee on my face, which soon became an itchy irritant. However I have become rather attached to the old thing – the joy of reading a book with a thatch to twiddle with does give me an unwarranted air of professorial-like erudition. It has also been splendid to have strangers bowl up to me and talk to me about little Mo, rather like when walking a dog on a green.